Maryland’s Democratic candidates running for governor appear, on the surface, at least, to be unified in supporting the eventual winner of the June primary. The Democratic candidates have said on the record that no matter who among them emerges on June 26 as the victor, they’ll unify in spirit (and, perhaps, in resources) to beat popular Republican Gov. Larry Hogan in the November general election. The unenviable task of brokering unity amid competing Democratic candidates is the job of Maryland’s Democratic Party chair, Kathleen Matthews. While Matthews’ negotiating skills may have yielded a pledge of unity in the Democratic gubernatorial contest, not so much in the 6th Congressional District Democratic primary. To date, Matthews – an unsuccessful congressional candidate herself in 2016 – has failed to broker a unity pledge among the eight-person Democratic field in the 6th Congressional District. Matthews’ speech at Washington County’s annual Democratic Dinner on May 29 at Fountain Head Country Club in Hagerstown left attendees with the impression that no deal has been made among the CD-6 Democrats to support the eventual nominee. “We’re looking for that unity in the 6th District,” Matthews told the crowd of 75+ people, shortly after boasting that the Democrat gubernatorial candidates have all pledged to support their eventual nominee. A Miner Detail contacted the Maryland Democratic Party with a request for comment about whether Matthews has been able to broker a unity pledge among the Democratic CD-6 candidates. “Every time Kathleen talks to a Democratic candidate in a primary, she encourages them to support the nominee and come together to elect Democrats up and down the ballot in Maryland in November,” emailed Fabion Seaton, the communications director for the Maryland Democratic Party. Seaton’s statement did not directly address whether unity has been brokered among the CD-6 Democrats. What – or whom – is preventing the CD-6 Democrats from unifying after the primary? One CD-6 Democrat unloaded on Trone, telling A Miner Detail on background that if Trone wins the June primary, they will not support him and will not help him beat the eventual Republican nominee. 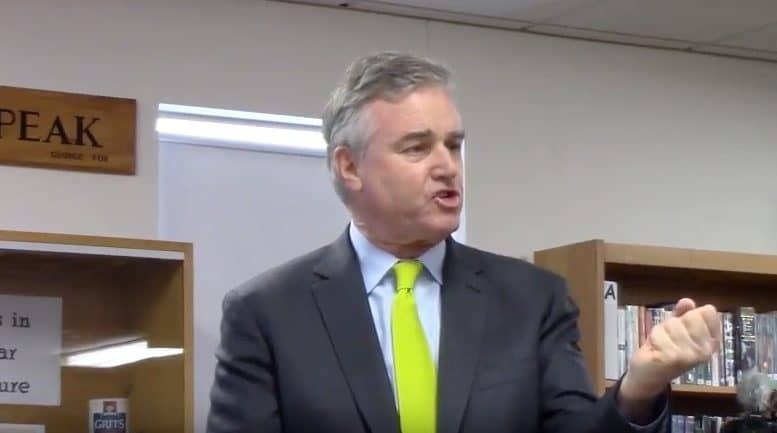 “David Trone does not represent our Democratic values. His attempt to buy the race and to buy off elected officials is everything I have fought against in my career. And his leaked memo about garnering African-American support in the district is disgusting and disqualifying. Not only was the leaked memo earth-shattering, his words are a clear indication of how he ran his company as a CEO. He is commoditizing minority communities to gain votes, and he’s buying politicians with fancy dinners. That’s not who we are as a party,” said the Democratic candidate. When reached for comment, another Democratic candidate told A Miner Detail on background that they may support Amie Hoeber over Trone, the presumptive CD-6 Republican nominee. “If David Trone wins the primary, he will lose the general election against Amie Hoeber, no matter how much money he spends,” one other CD-6 Democrat told A Miner Detail on background. Republican Amie Hoeber, a former Pentagon official and defense contractor, is expected to win the CD-6 Republican primary for the second time. Hoeber won the 2016 Republican primary but was defeated by outgoing Rep. John Delaney (D-Md.) in the November general election. The 6th District stretches from Western Maryland – Garrett, Allegany and Washington counties – to parts of western Montgomery County to Potomac. June 26 is the primary.